The trend of UHD TV's has slowly been sweeping the nation and I thought that I would draw focus on some UHD TV's so you all have full knowledge of the current technological trends within 2016. I know what you're all thinking... What even is UHD, Jamie? 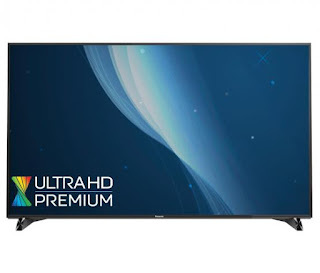 It kinda sounds like a type of milk or something thats a tad nasty... UHD simply means Ultra High Definition so you will get extra clarity on your screen. This means that you'll be able to see every feature of a character in detail or the background of a live news broadcast in full detail. There are many TV's that are amazing that are on the market but I honestly love Panasonic's UHD TV's and I am going to tell you why. Theres the pro-grade Cinema Display. This recreates the experience of being at the cinema but at home! Panasonic's Honeycomb local dimming system means that deepest blacks can be possible on an LED TV. All of this gives bright stunning colours to the TV which creates a great HDR (High Dynamic Range) experience for anyone watching the TV. These TV's also have 4K which makes them ultra amazing! The designs of the UHD TV's are very unique. The frames and pedestals of the TV means that it is a fashion statement on its own and will compliment any living room no matter what the interior design is! They will be the talk of the town! You also get Freeview Play already installed on the TV. You get On Demand channels such as BBC iPlayer, ITV Hub, All 4 and Demand 5. You also get all the HD channels which benefit the quality of the screen. You can also pause the TV when you need to and you can scroll back through the TV guide back through the last 7 days to catch up on all the shows that you've missed out on! Have you got a UHD Television? What do you think about the hype? Let me know down below! If you want to view more of the UHD range from Panasonic then click UHD TV Panasonic! I hope that you've enjoyed this blog post and I hope that you come back next time to read another blog post! This is a sponsored post in collaboration with Panasonic. All views, ramblings and whatnot are my own. Thanks.